Made from a high-quality 50/50 polyester-cotton blended fabric specially developed for the Pitchfork product line, the products withstand even the most adverse conditions. 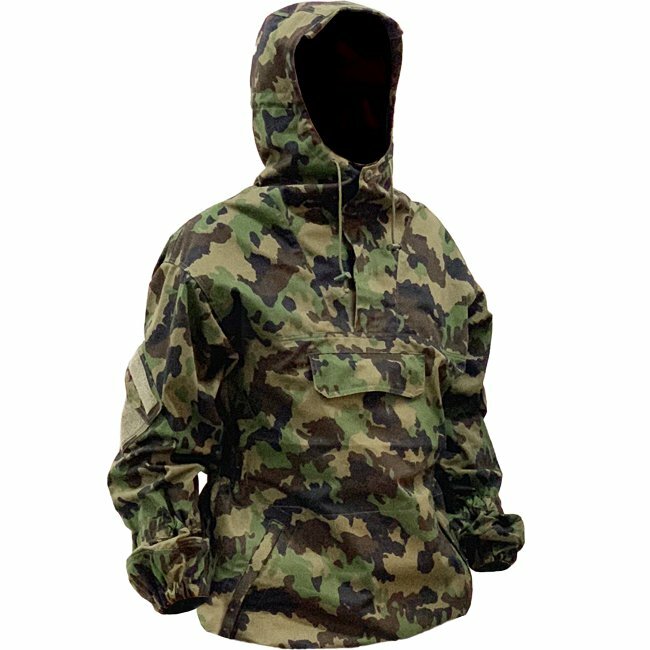 The camouflage fabric has a technologically advanced "near infrared" (nIR) treatment to reduce the visual signature when viewed through a modern military night vision device. The properties of the camouflage pattern therefore remain intact in the dark, the material generally reflects light only very slightly. The basic concept of the original has been retained as much as possible so that the "tactical pajama" character, as expected by users of a Gorka uniform, is not lost. Accordingly, the uniform feels comfortable when worn, it gives a lot of freedom of movement. The buttons have been supplemented as far as possible with modern velcro, so that both can be used. On the hood there is also a small visor to protect against rain or sunlight. It can be folded inside when not in use and held in place by means of a velcro fastener. The hood is big enough to fit over average sized helmets. The jacket's spacious upper arm pockets feature velcro on the outside to attach insignia and patches. The frontal pocket in the center of the torso features velcro closures too. Underneath a pocket with side openings for the hands can be found. The hem circumference can be varied thanks to a drawstring.